Petra Trenkel (*1968 in Bischofsheim/Hanau) studied at the Hochschule für Bildende Künste, Städelschule in Frankfurt/Main. 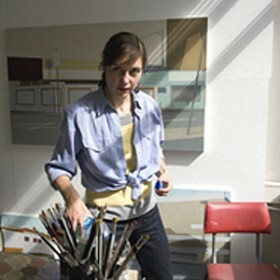 In 2003 she was a participant of the Goldrausch artists’ project in Berlin, in 2005 she had a residency of the Hessian Culture Foundation in London, and in 2006 she had a residency at the Chinati Foundation in Marfa, Texas. She lives and works in Berlin. 'Zweite Ebene', an exhibition by Petra Trenkel and Catrin Bolt is at Galerie Kvant, Berlin from 28 April until 11 June 2011.